The Dambulla Cave Temple and Sigiriya Rock Fortress are two UNESCO World Heritage sites that a visitor should not miss during their visit to Sri Lanka. When I had the opportunity to visit Sri Lanka, these were two places that I was very interested in visiting. I had seen pictures online, but I wanted to see these sites with my own eyes. 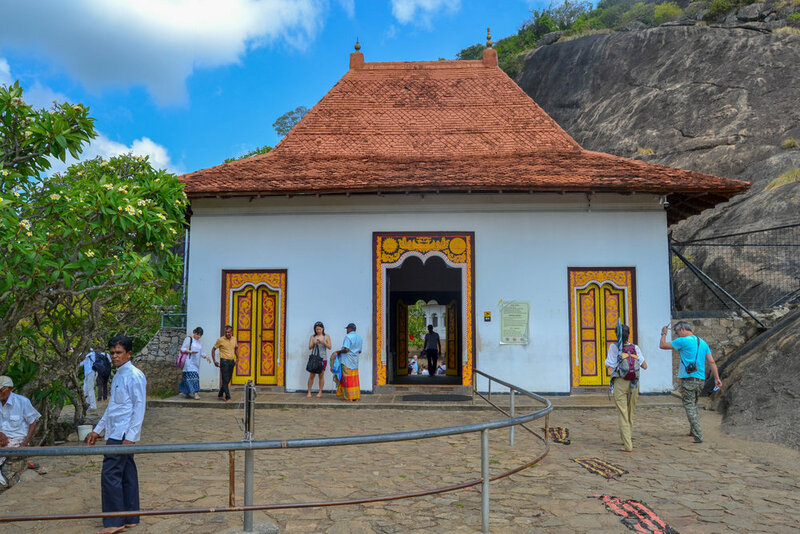 Because my time in Sri Lanka was relatively short, and I was based in Colombo, which is not particularly close to these places, I opted to book a day tour to both of these places. Even though the day was long (approximately 14 hours with a start time at 5am), it was definitely worth it. Since these places are not close to Colombo and require a significant amount of driving time, the tour started bright and early with a very early pickup from my hotel in order to get ahead of Colombo’s infamous traffic jams. Initially, I thought there would be other people on the tour since I got picked up in a van, but it was quite surprising to find out that the entire van was just for me. Once the driver picked me up, we started the journey to Dambulla. If I have to be honest, I was shocked that the driver did not hit anyone while en route, or that we did not get into any accidents. The driver flew down the road and had no problem overtaking people on two-lane roads at high speeds. There were even several times when he slammed on the brakes because of close calls. However, in the end, it was all for a purpose. The driver ended up making a 4 and a half hour drive a 3-hour journey. This was not necessarily a bad thing since the early arrival gave me more time to check out the sites. Upon arrival at the Dambulla Cave Temple, the driver dropped me off at the entrance, got the entrance ticket, and then headed back to the van to wait. To be honest, the driver did not serve as a guide. His main job was to get to me the destinations and back to Colombo, so as far as I was concerned, he did his job. Plus, while it would have been good to have had a tour guide give information about the sites, it did not bother me so much since I always enjoy exploring on my own. The Dambulla Cave Temple is located in central Sri Lanka, dates to the 1st century CE, and still functions as a Buddhist monastery in the modern day. In order to get to the Dambulla Cave Temple, a visitor is required to climb a series of steps that lead up to the complex. The walk up is not particularly difficult since the stairs are not steep, and the climb up provides some amazing views of the surrounding landscape. Upon reaching the entrance of the complex, it is mandatory to remove your shoes and give them to attendants who will watch them for a very nominal fee of about 25 rupees. 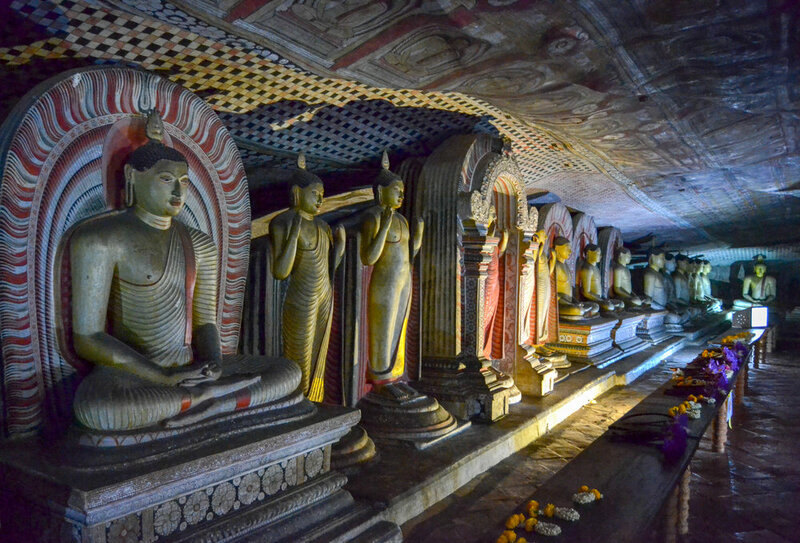 The Dambulla Cave Complex is large and made up of several caves that contain statues of the Buddha and highly decorated cave paintings showing scenes related to his life. There are several different caves, and they feature mostly statues of the Buddha meditating along with various Sri Lankan kings and Hindu deities, such as Ganesha and Vishnu. Not only are there statues of the Buddha meditating in a lotus position, but there are also large sculptures of the Buddha reclining, which are over life-sized. In some cases, the length can be as long almost 50 feet. Please enjoy the photo gallery! All photos were taken by me using a DSLR and iPhone! After I finished exploring the Dambulla Cave Temples, I headed back down to meet the driver, and then we headed off to the Sigiriya Rock Fortress, which was about an hour away. To be honest, this was a place I had seen many pictures of online, and I was super excited to be able to finally see it in person. Like the Dambulla Cave Temple, the Sigiriya Rock Fortress is a World Heritage site. According to historical sources, King Kasyapa chose this site for his capital in the 5th century CE. He then built his palace at the top of the rock and had colorful frescoes painted on the side. Upon arrival at the site, I followed the driver, and he went and bought the entrance ticket. Once again, he told me that he would meet me at a specified place, and then I was free to take as much time as I wanted. Once the driver took his leave, I headed to the Sigiriya Rock Fortress, which towered over everything else. In an effort to beat the crowds which were quickly building, I immediately headed toward the rock since my main goal was to get to the top and get some amazing views of the lush landscape that surrounds the area. Even though it was extremely hot and humid, I had water with me, so I made my way up to the top. Before reaching the top, there are two main levels. The first part is about halfway to the top where it is possible to see some of the preserved cave paintings that were once much larger but much of which has been lost to time. It is still unclear what they feature, but theories have been put forward claiming they show possible consorts of a Sri Lankan king to women taking part in a religious ritual. However, it is not possible to positively identify whom they were. Once you move past the paintings, the path continues upward to a second area where it is possible to rest for a bit before moving onto the Lion’s Paw and Gate, which leads to the top and remains of the palace. 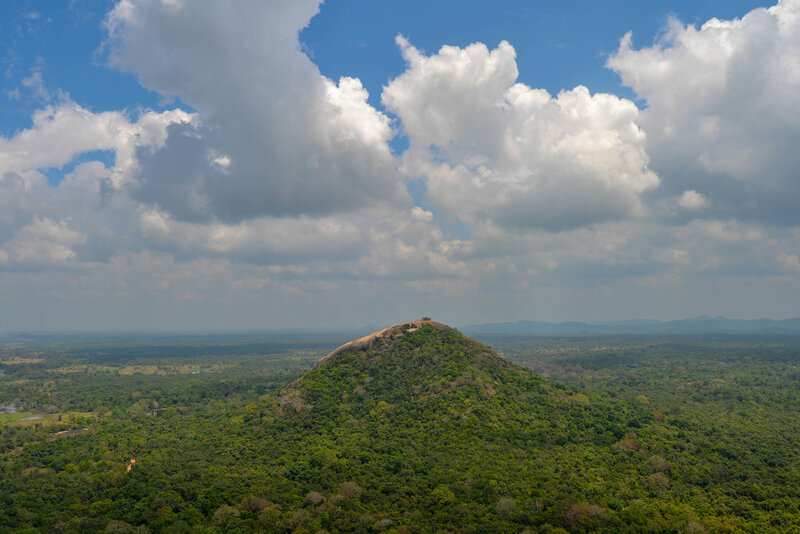 Despite the fact that I was absolutely drenched in sweat, I was determined to reach the top, and after taking a couple breaks midway up, the top of the Sigiriya Rock Fortress was finally reached. 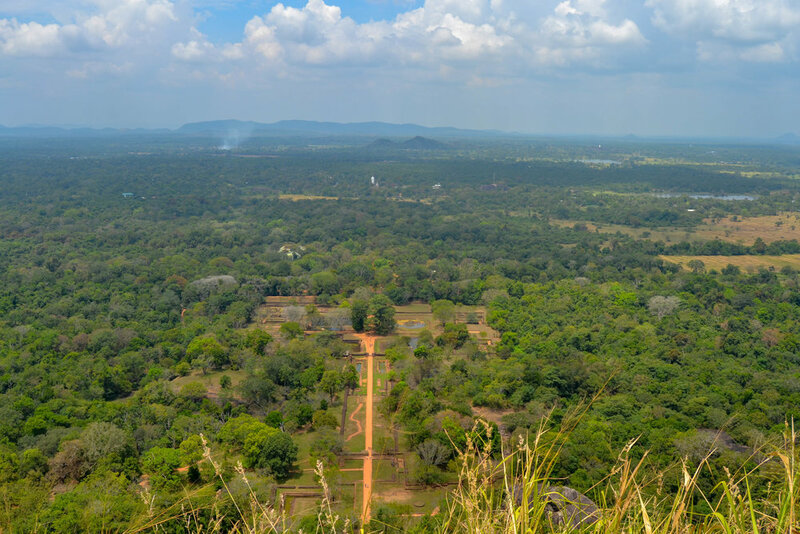 Not only was it possible to see amazing views of the Sigiriya Gardens from above, it was also a fascinating experience to see how the palace was laid out at the top. Even though the structures are now long-gone, the foundations still exist. As I wandered around the area, I could only imagine how this would have looked in its heyday. Overall, while it was a very long day since I only returned to Colombo at around 7pm, I got to see the two sites that I had been looking forward to seeing for several months, and they both certainly exceeded my expectations. 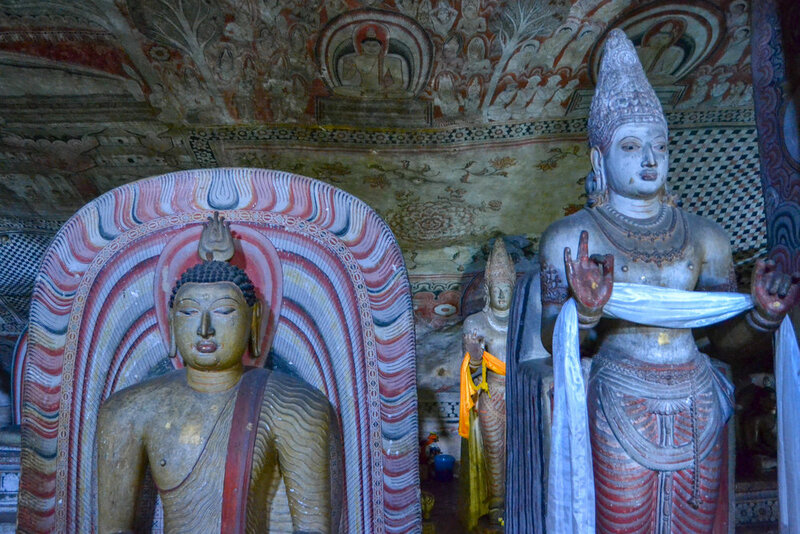 Have you been to the Dambulla Cave Temple and Sigiriya Rock Fortress? What did you think of it?